We have been blessed with the most dedicated fans in the business and I’d like to take a moment to thank our new members of PlayStation Nation for helping us to achieve nine consecutive months of growth on the PS3 platform. We are constantly looking for new and innovative ways to enhance your entertainment experience on the PS3 and we’re so excited this week to deliver on this promise once again. Today, your PS3 experience already includes Blu-ray games and movies, streamed TV shows and sporting events, and unique original programs, but as we showcased on the E3 stage today, it also delivers cutting edge 3D technology and the most ultra sensory and precise motion gaming solutions available. There is no denying that Sony is the undisputed leader in 3D technology today and we are the only ones to offer an end to end solution to consumers. With four stereoscopic 3D games available for download already, PlayStation is truly leading the effort to bring theater-like experiences into your living room. There are nearly 36 million PS3 units around the world that are 3D ready today and with demos on the show floor that range from Killzone 3 in 3D to Gran Turismo 5 in 3D, you can get a glimpse of what the future holds as we alter what immersive gameplay means with 3D technology. We are also experiencing tremendous growth on the PS3 platform and have already started the year with huge releases such as MAG, Heavy Rain, God of War III, MLB 10: The Show, and ModNation Racers. 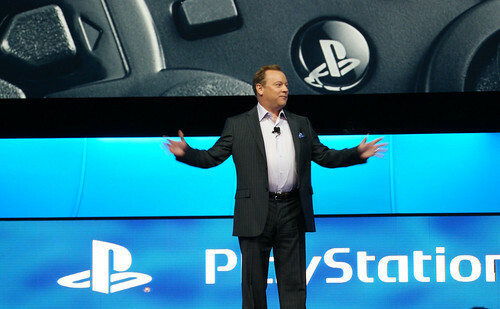 Many would call this a blockbuster year, but for us it represents just the first half of what will surely be an onslaught of brand new experiences with the PlayStation Move controller, in addition to richer and deeper experiences from some of our most favorite characters and franchises like The Sly Collection, Twisted Metal, SOCOM 4, inFAMOUS 2, and LittleBigPlanet 2. We’ve also been working hard to enhance our digital entertainment offerings, which comes packed today with access to live baseball games from MLB.tv, premium original content from HBO, and 23,000 movies and TV shows from all the major networks and studios. We also unveiled PlayStation Plus, an opt-in and add-on service package designed specifically for PlayStation Network’s most avid power users. PlayStation Plus will provide subscribers with added value, access and convenience to special features like discounts on PlayStation Store content, free and exclusive access to select games, full game trials, and much more – all for $49.99 a year. A tremendous value. In the first month alone, you’re getting $49.99 worth of content for free. Existing features and services you enjoy today and have come to expect from PlayStation Network as part of your daily experience, will remain unchanged and free to access. We set an incredibly high bar last year and we expect to surpass it this year by reaching our goal of 15 million PS3 units worldwide. When we say ‘It Only Does Everything’ we know we’re also making a promise to you, that we will continue to deliver new experiences and entertainment options that you didn’t even know you wanted today and many years from now. For those of you who were not able to join us at the Shrine auditorium this morning, you can download the full presentation on the PlayStation Network. I also invite all of you to virtually attend E3 in PlayStation Home where you can view our full presentation an experience a virtual replica of our PlayStation booth.